BNSF Railway wanted to expand their rail lines to accommodate three tracks in Barstow, California. Contech MULTI-PLATE pipe arches were chosen to fit and extend existing MULTI-PLATE structures in place along the track. Installation time became a challenge when they realized the railroad needed to remain open during construction. A 14-hour window was given to assembly crews for the multiple culvert extension before the tracks were opened to live freight. Due to the shortened time frame, BNSF chose two MULTI-PLATE pipe arches with concrete paved inverts and two CSP round pipes. The structures were pre-assembled adjacent to the existing wood trestle bridge and positioned under the existing railroad tracks. The construction process concluded with a slurry fill around the openings to secure them in place within the existing trestle structural members. 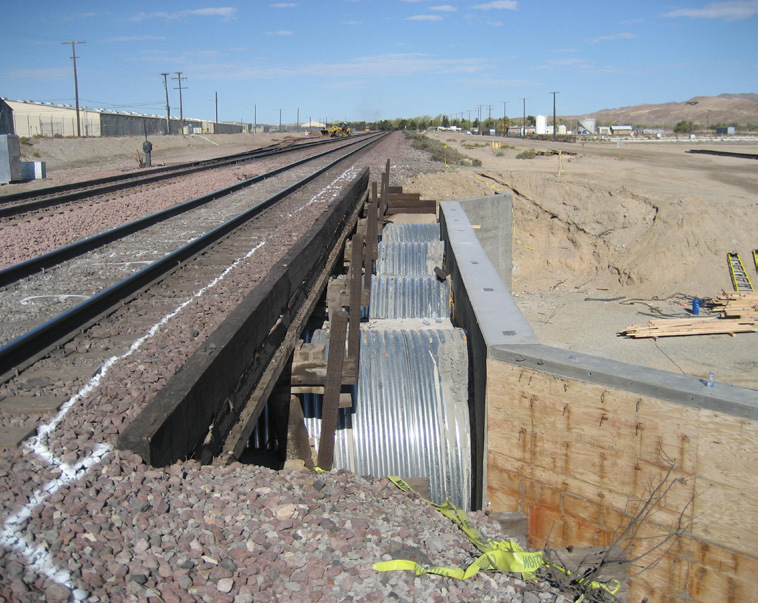 Despite minimal cover over the culverts, the MULTIPLATE arches with slurry backfill supports the railroad loads required for this project.